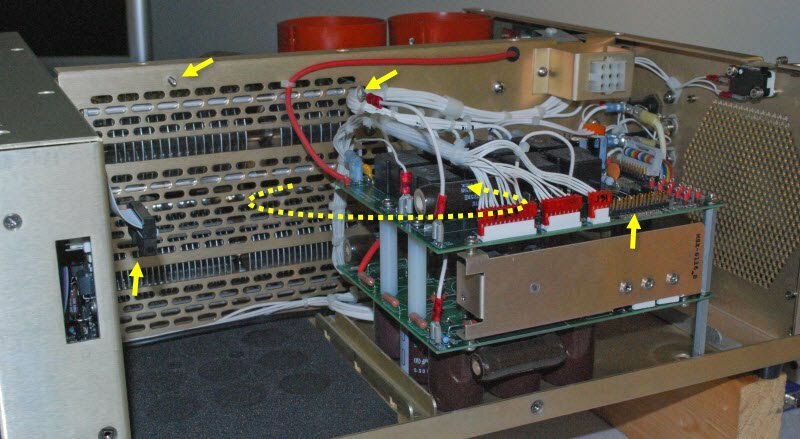 The high-voltage metering resistors in the 8410 are responsible for the accuracy of the plate voltage reported via telemetry and displayed on the front-panel LEDs. 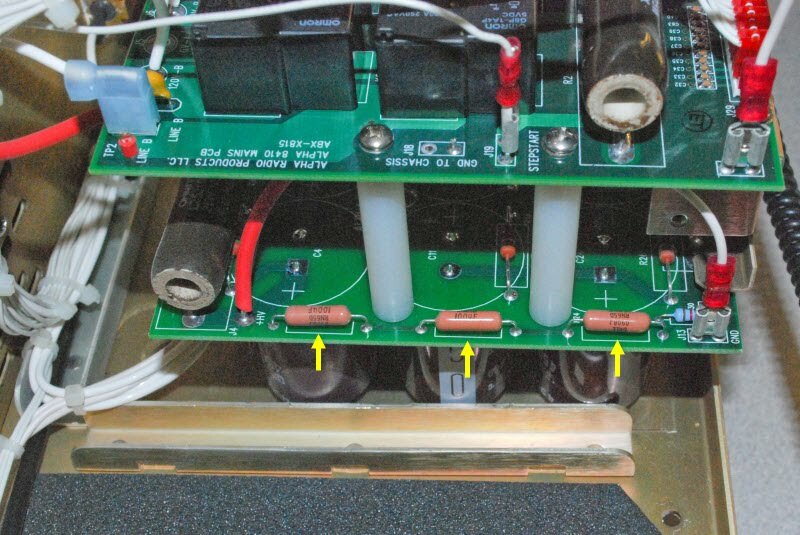 As reported on the Plate Voltage Issue page, the original metering resistors were not up to the task. When I got replacement metering resistors from RF Concepts (under warranty) Molly sent instructions for their replacement. Those directions were for replacement in a 9500. While the overall process is similar I thought I'd document what I did to replace the metering resistors in my 8410. Disconnect and remove the power transformer. Remove the screws holding the HV and mains board stack (the stack between the power transformer and the front of the chassis). 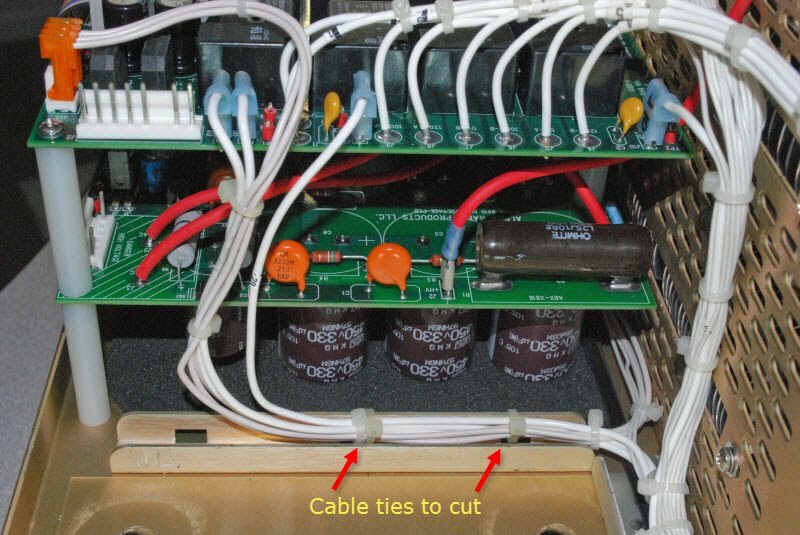 Cut the small cable ties that hold the white wire bundle in the U-channel between the stack and the power transformer cavity. Disconnect the front panel ribbon connector. Disconnect the grounding ring terminal from the center partition. Swing the entire stack 90 degrees counter-clockwise (looking down into the chassis). Basically the stack will go into the power transformer cavity. Confirm the resistors are replacement candidates (I don't know if there's a certain manufacture date and/or serial number beyond which the new resistors became factory installed). De-solder the existing resistors. RF Concepts recommended just clipping the resistor leads near the resistor bodies and soldering the replacement resistors to those stubs. I preferred de-soldering because I have a great temperature-controlled iron and I didn't want it to look like a retrofit. Choose the method best for you. Once the resistors are soldered in place be sure to remove all flux with isopropyl alcohol. At 3 kV it's possible flux residue will break down, ionize and allow an arc-over to ground or a low-voltage trace. According to Glenn at RKR, this has happened and it took out all four PCBs. Swing the stack back into place. Re-attach the front-panel ribbon connector and the center partition ground lead. Dress the lower white wire bundle back into the U-channel between the stack and the power transformer cavity and secure with small cable ties. Replace the power transformer and reconnect the transformer leads.